Blood Serum Test Is Not An Accurate Measure of Magnesium Deficiency. Medical Expert, Dr. Carolyn Dean, MD, ND says Magnesium levels cannot accurately be measured by testing blood (serum) magnesium status. Los Angeles, CA, May 9, 2010 – Over 72% of Americans are magnesium deficient due to the depletion of this mineral from our soils and hence from our foods. Our modern diet of processed foods, refined sugars and simple carbohydrates are empty foods that do not give us the necessary nutrients for a healthy lifestyle. If you think magnesium levels can be measured through a simple blood test, think again. 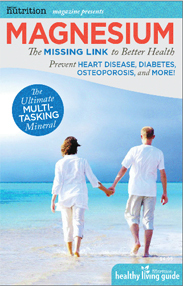 According to Dr. Carolyn Dean, “In spite of, or perhaps because of, all the metabolic processes that rely on magnesium (over 350 processes), less than 1 percent of our body’s total magnesium can be measured in our blood; the rest is busily occupied in the cells and tissues or holding our bones together. “Therefore, it is virtually impossible to make an accurate assessment of the level of magnesium in various body tissue cells using a routine serum magnesium test. This test is often called a total serum magnesium test, which you might imagine relates to all the magnesium in your body—but it does not. “Magnesium in the blood does not correlate with the amount of magnesium in other parts of your body. In fact, if you are under the stress of various ailments, your body pumps magnesium out of the cells and into the blood, giving the mistaken appearance of normality on testing in spite of bodywide depletion. A survey conducted by The Gallup Organization found that 72 percent of adult Americans fall short of the Recommended Dietary Allowance of magnesium. Because magnesium is required for hundreds of enzymatic reactions (enzymes are protein molecules that stimulate every chemical reaction in the body), deficiency can cause a wide variety of symptoms, such as low energy, fatigue and chronic fatigue, weakness, PMS, menstrual cramps and hormonal imbalance, insomnia, osteopenia, osteoporisis, bone mineral density loss, muscle tension, spasms and cramps, cardiac arrhythmia and cardiovascular disease, headaches and migraine headaches, anxiousness, nervousness and irritability.